Rotarians are often full of surprises. 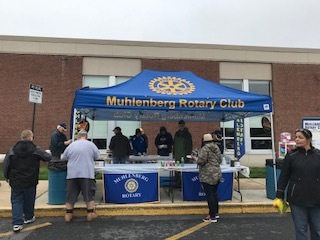 The latest innovation of Muhlenberg Rotary was the origination of the “Amish Hot Dog” through the collaboration of Steve Adams and Fred Hatt. All this came about from a germ of an idea hatched at our Area 3 Rotary Picnic on Wednesday. Steve brought the Jake & Amos Chow-Chow from Dutch Valley Foods and it was dressed on several dogs today. A combination heretofore unknown to the common folk was a delight to the eye and the taste-buds! With three lawyers in attendance, we have little doubt this concoction has already been patented and trademarked with the recipe copyrighted. This entrepreneurial effort would have delighted our recently departed Ed Collins, who was always looking for a clever food vending product. We miss him. Also full of ideas was our always practical Mike Lepera. Little things like putting foil on the upper shelf of the grill to prevent overcooking or keeping the coffee creamer in an ice bath to assure freshness were good ideas. A great time was had by all, even though we all woke up to raindrops falling at around 6:00 AM. That was just our good lord cleaning up for the day. We had fine weather compared to Friday night or Saturday afternoon. Sales were steady all morning and we managed to sell quite a few dogs. Great Job by Steve Adams, Tim Bitting, Sean Fitzgerald, Fred Hatt, Jack Krishock, Mike Lepera, Terri Pfennig and Lin Seyler . We missed Allen, Sam, Garland, Amy, Tom and John. Hope everyone can make it to our joint meeting on May 22nd. It’s a partners night, so let’s all turn out. Email Tim with your menu choice by the 17th.